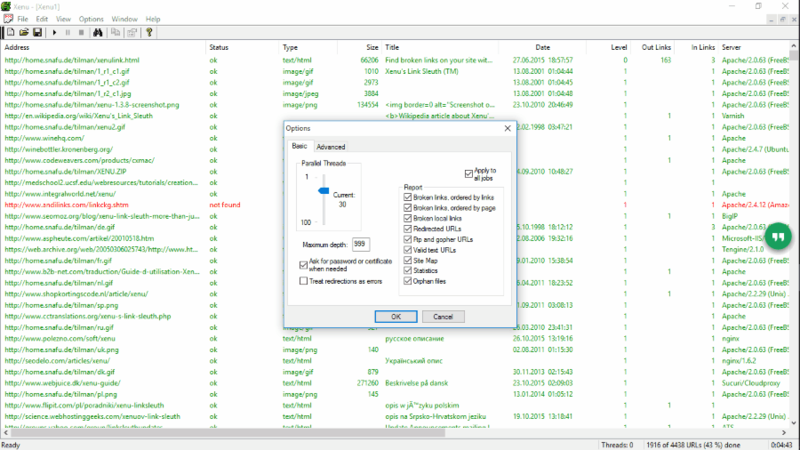 Here is a list of free broken link checker software for Windows. These software are capable of crawling a website, and check broken links. All you have to do is, put a URL, and the let these tools work. Few of these software show broken links as a list, while few of them just highlight the broken links. Some of these broken link checkers are also capable of generating reports. You can export reports with the help of these link checkers in various formats, like: HTML, XML, CSV, XLS, XLSX, etc. These software to check broken links crawl the websites, and check every links available. Status of each link is displayed for you to perfectly optimize a website. I found out 15 best free tools to check broken links on Windows, and listed them below. Apart from the description of the freeware, you will also find a short tutorial on how to check for broken links with the help of these tools. Xenu’s Link Sleuth is my favorite broken link checker. It has options to check links on a website, and filter out the broken links. You can set various parameters, and also include/exclude any type of URL from on the list of links. It lets you Generate report and export them in different formats. You can also check out the list of best free WYSIWYG HTML Editors, Online HTML Editors, and Notepads. Set number to check parallel threads (1-100). Set parameters to be included in the report, such as: broken links, broken local links, redirected URLs, Ftp and gopher URLs, Valid text URLs, Sitemap, Orphan files, etc. Fail http and ftp URLs with same failed host. The generated report shows link parameters, like: Address, status, Type, Size, Title, Date, Level, Out Links, Server, Error, Duration, Charset, and Description. This broken link checker can save the report in various formats. You can save the report as Xenu file (.Xen), Tab separated file, or GraphicViz file. Reports can also be generated and directly sent to an email, or multiple emails. While performing the check, you can pause the process at any moment, and resume it from the same moment. Search option lets you find a specific link and its status. Its one of the simplest and best broken link checker. Link Checker is a GPL licensed broken link checker which is absolutely free to use. To check broken links put the website URL in the URL box, and hit Start. You can set parameters to the broken link checker, such as: Recursive depth, Verbose output, Debug, Warning if a string is found, Ignore a given URL, and configuring the report. When you start the search, Link Checker displays the Parent (source), URL, Name, and Result. The Result column shows the type of error that occurred. You can save the report in various formats, like: HTML, CSV, XML, and TXT. 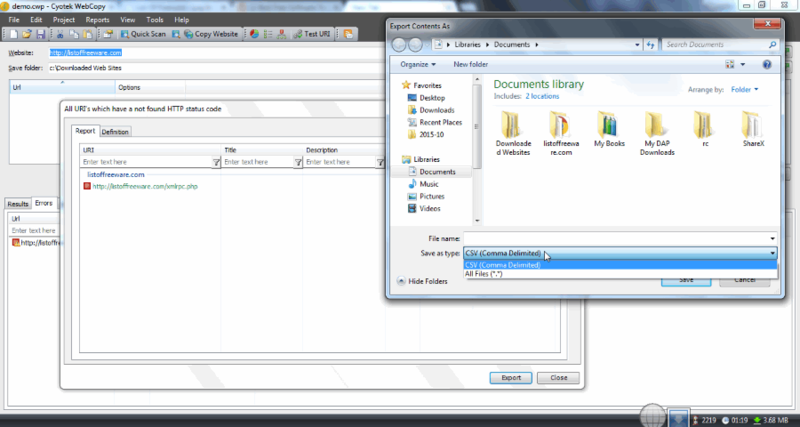 It also lets you save a report as project in .LCP format which can be read only by this software. Link checker also displays results, such as: Number of Valid URLs, Warnings, Invalid URLs, Content type statistics, and URL statistics. You can stop the process anytime you want during the check. Starting the process will begin to check the URLs all over again. Screaming Frog SEO Spider is a multi platform broken link checker. This software works on Windows, Linux, and MAC computers. Its generally used to crawl into a website through its links, images, scripts,CSS, and Apps. It fetches all the elements of the website and displays them in different tabs, so that you can figure out the SEO issues. This broken link checker is a versatile SEO tool. Click on a link, and you can view the URL info, inlinks, outlinks, and SERP Snippet. Various other tabs are available to view the website data, such as Internal Links, External Links, Protocol, URL, Page Titles, Meta Description, Meta Keywords, H1, H2, Images, Directives, AJAX, Analytics, etc. The Export option lets you create reports on various parameters, like: Inlinks, Outlinks, Anchor Texts, Directives, Images, or you can also create a custom report. It is one of the most widely used tools. The free version is has few limitations to it. You can only crawl up to 500URI, only few configuration options available, and no direct connection to Google Analytics API. You have to purchase a license to use all the features of this software. URLs, Error contacting Remote Servers, Timeouts, Error if redirection is found, etc. You can also check and uncheck the Error HTTP codes if you want to filter some specific error. Any of these 3 options can be toggled On/Off before performing an operation. You can view the Broken Links in the Errors Tab. It displays the broken links, and invalid HTMLs. The broken links are highlighted in red. You can only view the report in this broken link checker, as there is no option to export the generated report. Cyotek Webcopy is a very useful software where you can check broken links of a website. This broken link checker displays all the links with error, and is capable of creating a detailed report. This freeware is actually a website downloader which downloads an entire website to your computer. To check the broken links, enter the website URL on the software, go to the Project tab, and click on ScanWebsite. The software then scans the entire website and its links. You can also check broken links while downloading a website. It displays all the broken links under the Errors tab. The Error tab displays the broken link's URL, along with the error it returned, and details. 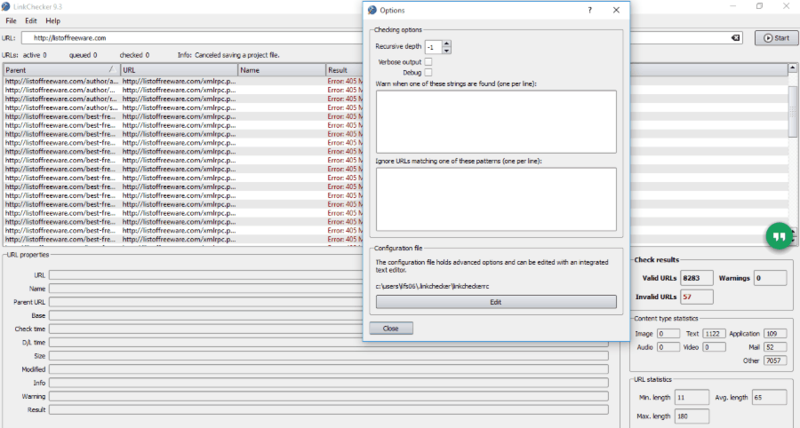 This software also lets you add exceptions to the links which you do not want to scan, copy, or download. Once the scan, or download is complete, you can go to the Reports tab, and click on Not Found to generate a report. The report is generated in CSV format. This broken link checker has various other features as well. 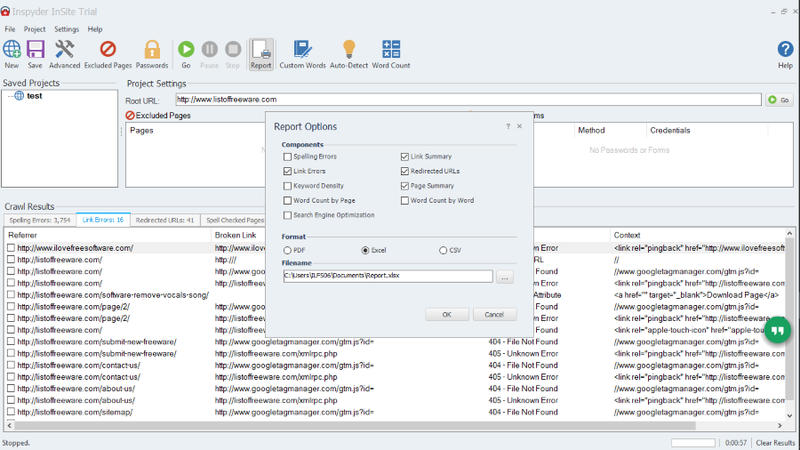 You can also generate reports for Images, Redirects, Slow Pages, Empty Meta Data, etc. Site Link Checker is an exclusive broken link checker software. This software checks the broken links of a webpage for free. Simply enter the URL of the webpage, and click on Check Site Links. This freeware lists all the links available on the webpage. The active links are marked by green icon, whereas the broken links, or non responsive links are marked with Red icon. This software is extremely light, and responsive. Inspyder InSite 5 is a versatile SEO tool which can which can check any website for broken links. To check broken links, open a new project, enter the URL of the website you want to check, and click on Go. It starts to crawl into the website and displays the result on the GUI. You will find all the broken links in the Link Errors tab. It displays the URL source, and Error type, along with the URL. You can also export the broken link report in various formats. Click on the Report tab, and check the Link Error component, select a format, add location, and filename for the report. Crawl upto 50 webpages for a website. Only 2 project configuration can be saved. Email reports cant be scheduled. 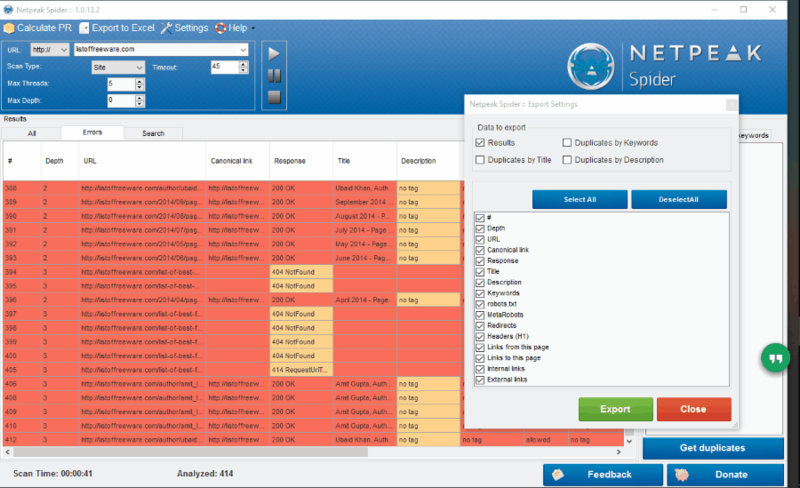 Netpeak Spider is a free broken link checker for Windows. The tool crawls within the websites and locates broken links, errors, incorrect redirects, duplicate titles, and more. All you have to do is enter the URL, and press the Play button. The broken link checker lists all the links, and highlights the links with error in red color. The report generated displays the URL, canonical link, responses, title, description, etc. This freeware also lets you to export the report in XLSX format. You can export the report with all the details, or you can select the details manually. Do not check external links. The list displays the status of all the found links. You can either view all links in the Processing tab, or go to Broken Links tab to view the broken links. You can view all the details of the broken links, which include: Status, title, content, size, type, etc. Go to the Reports tab to export the report. Export the list of all links, or just export the broken links report. Report can be exported only in HTML format. SEO Quake is a Chrome Extension which can help you with checking broken links on a website. This broken link checker not only lists the broken links, but also other important SEO parameters. To check the broken links, open a website, click on the SEOQuake icon, and go to Page Info. A new tab opens up with all the page information. Go to the Internal and External tabs, and click on No Follow to check the broken links. Along with the broken links, you can view the details of the link and the error message it they returned. The list of broken links can be exported as a report in CSV format. This broken link checker is an amazing SEO tool. You can view various page analytics with the help of it. View the page info, like: keywords, page rank, title, backlinks, keyword density, page diagnosis, internal and external links, and much more. It is one of the best SEO tools available for free. Download the extension. A small icon appears on the right hand side of the Address bar. Click on that icon. The tool starts to crawl through the webpage. It displays the total number of links, along with warnings, and Invalid links. Each hyperlink is highlighted. The valid links are highlighted with green color, while the broken links are highlighted with Red color. The type of error is displayed right besides a broken link. You can also add exceptions to the tool. Go to the small setting icon on the upper left corner of the tool. Add exceptions, URLs you do not want to include as warning, and other preferences. Link Checker is a Google Chrome Extension which is capable of checking broken links on a webpage. Find this extension on Chrome webstore, and add it to your browser. If you want to check the broken links on a webpage, click on the extension's icon, and click on Start Check. It highlights all the links available on the webpage. The healthy links are highlighted in Green, whereas the broken links are highlighted in Red color. It has no settings or any options, simply start checking the broken links, and view them. Link Miner is another free broken link checker. This is a Google Chrome extension, and can be found on Google Chrome Webstore. Its a very useful tool as it displays the total number of links, along with the healthy and broken links. It highlights the good links with green color, and the broken links are highlighted in red color. The type of error is displayed with every broken link. This broken link checker has a very useful feature of exporting the report to your device. The report is exported directly in CSV format. The report carries all the links of the webpage with their responses. This is a very useful ans portable SEO tool. The settings option lets you select the parameters for which the result is to be show. These parameters include: number of backlinks, reffering domains, social metrics, check all links/ external links, links to include in report, etc. 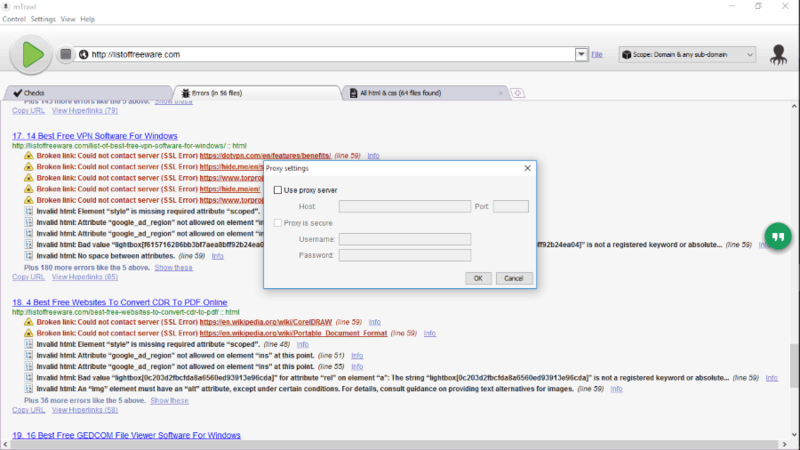 Link Checker for Mozilla Firefox is a free tool to check broken links on a webpage. This broken link checker can be found out on Firefox Add-on store. To check the broken links on a webpage, click on the add-on icon from the Menu. It automatically starts checking the links and marks them. The healthy links are highlighted in green color, and the broken links are highlighted in Red color. It doesn't have any other option or feature, but it does its job pretty well. Link Evaluator is an useful tool to check broken links of a webpage. This broken link checker is another free Mozilla Firefox Add-on which is available on Add-on store. It works like any other broken link checker, but with an additional feature. You can add exceptions to the URLs which you do not want to be checked. To check broken links on a webpage, right click and click on Evaluate Links. The active links are highlighted in green, and the broken links, or links with errors are highlighted in red. When you hover your mouse over the link, this Add-on displays the error message.